The Blanchester High School wrestling team was defeated in the quarterfinal round Sunday of the OHSAA Division III State Team Duals wrestling tournament at Ohio State’s St. John Arena. The Wildcats were defeated by the Rovers of Rootstown High School 45-25. In the photo is the Blanchester bench during the first match of the day when Jacob Hamm won by pin. 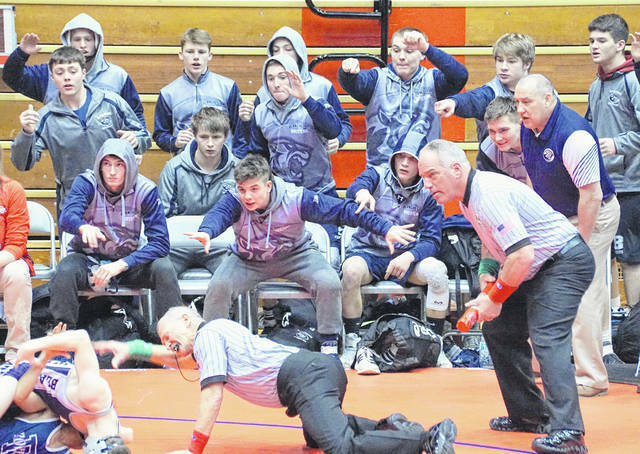 For more on the BHS wrestlers, see SPORTS, Page 10.
https://www.wnewsj.com/wp-content/uploads/sites/22/2019/02/web1_WR_blan_benchME-2.jpgThe Blanchester High School wrestling team was defeated in the quarterfinal round Sunday of the OHSAA Division III State Team Duals wrestling tournament at Ohio State’s St. John Arena. The Wildcats were defeated by the Rovers of Rootstown High School 45-25. In the photo is the Blanchester bench during the first match of the day when Jacob Hamm won by pin. For more on the BHS wrestlers, see SPORTS, Page 10.